If you are planning to attend the International Literacy Association July 18 to 20 (with Institute sessions on July 17), we would love to meet the friends of Literacy Beat in St. Louis. Please stop by one of our sessions and say hello! Author Signing: Thomas DeVere Wolsey, Diane Lapp, Maria Grant. The Internet is a largely unvetted, open access media and is available to any individual to publish any information. In contrast, print-based media, with a five century plus start on online media, has a number of traditional mediators and gatekeepers, such as editors, critics, and peer review processes in place. The Internet has shifted the burden for quality control and assessment of information, in terms of accuracy, objectivity, credibility, and trustworthiness, onto the online reader. And frankly, the online reader is struggling with the task. Research suggests that, in general, our students are struggling to realise that incorrect, false or misleading information can be posted on the web; rarely challenge the authority and reliability of information presented; are consumerist when searching for online information, i.e. find just about sufficient information to satisfy their information needs; lack prior knowledge to assess the veracity of information presented and detect hidden author agendas; and are often misled by the appearance of a website. An additional complexity with evaluating online information may relate to students’ abilities to draw on limited prior experience and world knowledge to assess and evaluate online information. 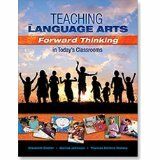 critical thinking skills a disposition for interrogating the text; evaluating arguments, and questioning content. critical reading skills an ability to evaluate relevancy, accuracy and reliability. critical multimedia information literacy skills a capacity to critically consume information and to separate the medium from the message. critical literacy skills an aptitude to view information as value laden i.e information is not neutral. Scrutinize the Support: ease of use, design features, multimodal elements, grammatical errors, spellings, working links, and citations. In Using Technology to Improve Reading and Learning (Harrison, Dwyer & Castek, 2014) a sample lesson plan is provided where the teacher employs the gradual release of responsibility model to explicitly teach, through think aloud, demonstration, and modelling, the critical evaluation strategies and dispositions necessary to determine the accuracy, credibility, trustworthiness, bias, reasonableness, coverage, relevancy, and currency about two websites related to Martin Luther King ( the controversial Martinlutherking.org website and the official website, http://www.thekingcenter.org) . Following explicit instruction the teacher can guide students as they critically evaluate the information presented on other paired websites using the four critical evaluation strategies. Students work collaboratively to assess the reliability of the information presented on the paired websites. Later, they discuss and present their findings to the class group. Younger elementary students could explore the following websites related to Christopher Columbus. Ask the students to collaboratively judge the reliability of information presented on both using the four critical evaluation strategies. Again the students present and discuss their findings with the class group. Using the four critical evaluation strategies, students in middle grades could evaluate which of the following websites is authorized by the World Trade Organization. 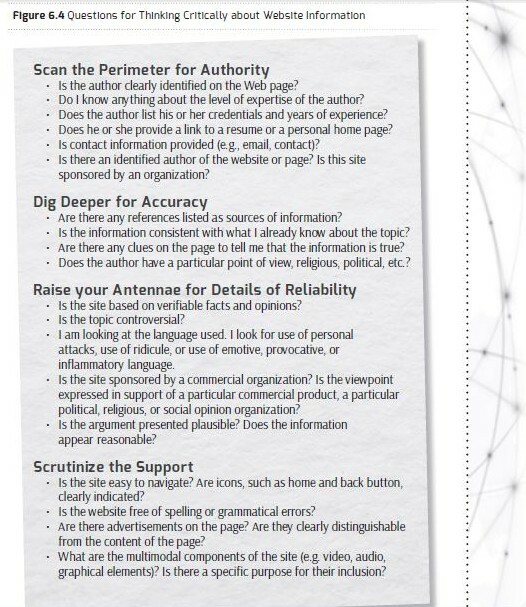 Here are some other resources which may help our students to develop the skills, strategies and dispositions to critically evaluate online information and resources; or at the very least they may raise students’ antennae to the possibility that false or misleading information may be posted online. Harrison, C., Dwyer, B., & Castek, J. ( May, 2014). Using technology to improve reading and learning. Shell Education Publications: USA.